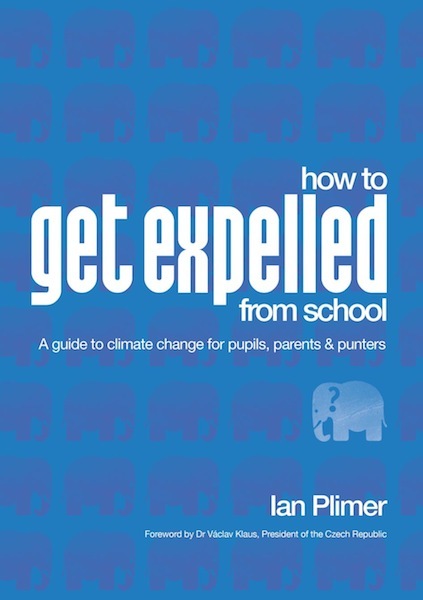 “How to get expelled from School – a guide to climate change for pupils, parents and punters”. More information and a pre-order form can be found here. Whatever you do, don’t mention the Mediaeval Warm Period. It upsets the warmistas. I hate the teachers running this agenda into impressionable minds … stop it and teach maths you dickheads! I’m putting my money on it being a best seller. @Gary, showing my ignorance … what did I miss? I think it will be a waste of money. You only need to ask 1 question of 99.99% of the warmist crew. Answer is almost invariably NOPE! That being said I think they will be 101 very interesting and educational questions and I will be buying a copy. I expect voices to be raised soon from the Green/Left suggesting this book be treated in the same way as the Peaceful Pill Handbook. Plimer (cha-cha-cha) etc (think Coalition reception on election night 2010). Should be mandatory reading for all. I’ll start with my two teenage nephews. That sorts out their birthday presents! Watermelons = Greens/Socialists. Environmentally Green on the outside, Red Socialist on the inside. Seemingly substantial on first mouthful then the disappointing realisation of very little substance. Heres a couple questions for Ian Plimer. i) Why dont you put forward your theories for peer review. ii) How much are you getting paid for your directorships on Kefi Minerals,CBH Resources and Ivanhoe Australia . Ah Duncan, welcome back. How we’ve missed your ad homs and smears (not). unless you happen to be a skeptic ,,, umm sorry , dirty denier . yes , you’re quiet right , but how much longer before there is ? how is that fair & reasonable ? duncan Ford your information is out of date and incorrect. Ian Plimer no longer has a non-executive position on the board of CBH Resources, since its takeover in 2010. As for Ivanhoe Australia Ltd. he is an Independent Non-Executive Director and at Kefi Minerals he is a Non-Executive Deputy Chairman. In case you are wondering there is a big difference between a non-executive and an executive director/chairman. A non-executive is a member of the board of directors of a company who does not form part of the executive management team. He or she is not an employee of the company or affiliated with it in any other way.